The Merrimon-Wynne House in Raleigh, North Carolina, is a classic venue perfect for Southern weddings. 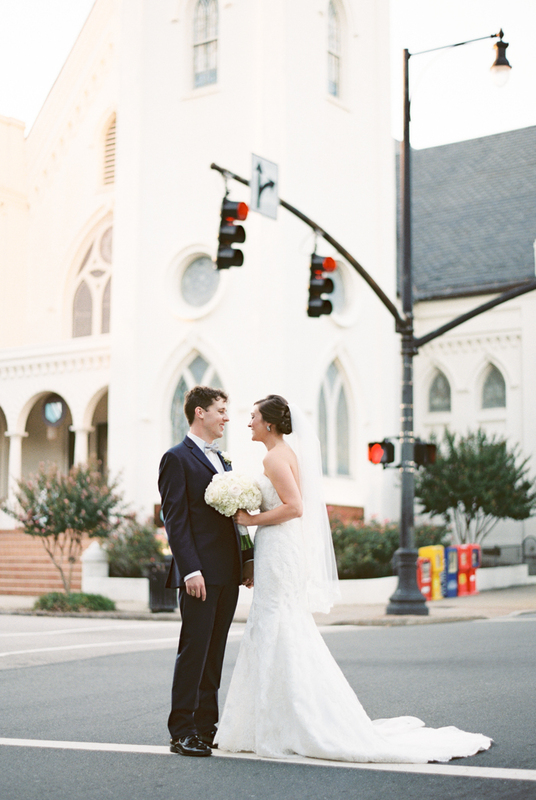 Carolina couple, Maria and Wesley, chose this superb location and planned a sophisticated and sweet day; however, it was the groom who coordinated a few surprises for an unforgettable experience. Photographers from Forage and Film knew right away upon entering the Merrimon-Wynne House that this wedding would be special. They began capturing each moment, starting with the bride getting ready. Maria really focused on the small details for her big day. Her bridesmaids all wore matching silk robes and sipped from matching floral coffee mugs. She gifted her mother with a personalized handkerchief. And her garter was embroidered special for the day. Maria wore a classic strapless lace fit-and-flare gown, a timeless choice. She accessorized with stud earrings and wore a fingertip-length veil for the ceremony. The first surprise from her groom was the addition of gorgeous banister flowers from their florist, Flowers by Eddie. What a sublime image it created as Maria descended the steps. She paused for a few photos on the porch. As she held her bouquet of white roses and hydrangea, Maria looked positively regal. Her bridesmaids wore strapless gray dresses with sweetheart necklines. They each carried a plush white hydrangea bouquet. Wesley and his groomsmen cut classic figures in black tuxedos with gray bow ties and cummerbunds. For the ceremony, everyone made their way to a nearby chapel via trolley! After the sweet ceremony, the couple and all their guests were back at the Merrimon-Wynne House where the groom’s second surprise was revealed. He commissioned a local artist to capture the special day on canvas. As guests dined and danced, the painter used each stroke to tell the evening’s story. The lively reception was bright and beautiful thanks to the ample natural light and décor, such as the hydrangea and rose centerpieces and white table linens. The couple created a charming photo opportunity for guests. A pew with two flower-covered screens and an antique door made for a sweet and sentimental backdrop. As the light was fading, the couple took a few photos as the newly minted Mr. and Mrs. before heading back to the reception. Maria took off her veil and joined her husband for a dance. She then changed into an elegant short dress for the rest of the reception. The last surprise was a sparkler exit. Guests lined both sides to send the couple off in a memorable and shimmering way. Brides aren’t the only ones who can have a little fun in the planning process. 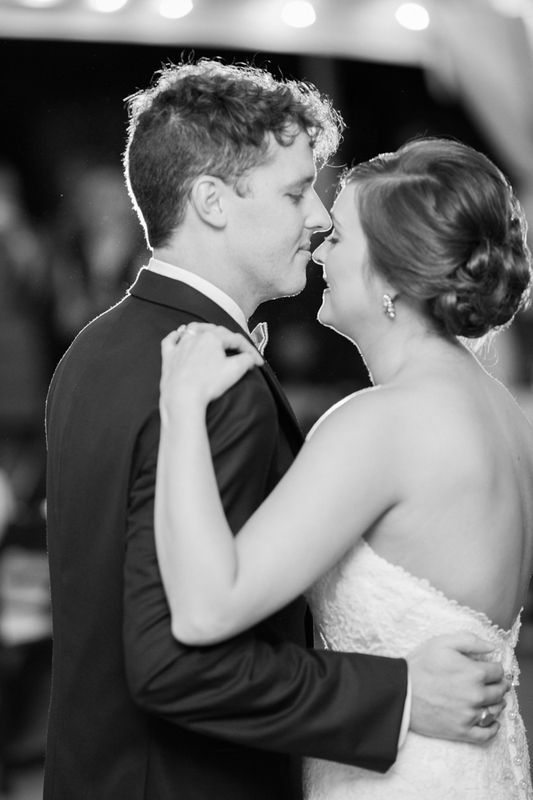 Wesley proves that grooms can have some surprises up their sleeves, too. This Merrimon-Wynne House wedding was eventful in more ways than one!